The new season of The Simpsons just started last sunday and this Sunday, October 4, 2015, Fox aired “‘Cue Detective”, the 2nd episode of Season 27, and the 576th episode to date. This Episode Fact File will recap the episode with pictures, video clips and more. Get the scoop right after the jump! 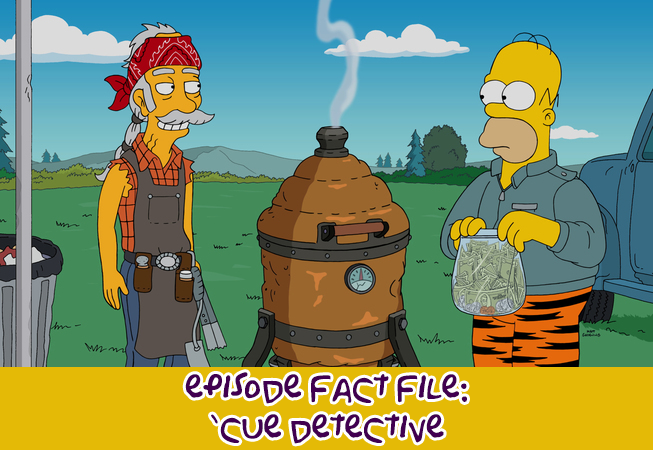 Episode Details: ”Cue Detective’ is the 2nd episode of Season 27 as well as the 576th episode of The Simpsons. The episode aired on FOX on October 4, 2015 and was written by Joel H. Cohen and directed by Timothy Bailey with Matt Selman and Al Jean as the show runners. After watching a boring movie at school, the children realized that Bart and Lisa are smelling badly and they start mocking them about it. Ironically, the same thing happened to Homer at the nuclear plant, which they found pretty unusual. Marge then reveals that the smell is coming from their clothes, because their washing machine is old. She then gives a bag full of money to Homer (taken from Bender‘s body) so they can buy a new washing machine. On his way to the store, Homer smelled smoked meat and discovered a roadside barbecue stand across the highway. He then tried out the meat and liked it a lot. The guy then reveals that the secret for such a good meat was actually his smoker that grills the meat on a hive shape, which was also available for sale, so Homer buys the smoker instead of the washing machine. After seeing that Homer spent all their money on a “grill”, Marge gets very upset, but soon after tasting his meat, she forgives him and join the family for a barbecue. Due to it’s smell, people from all Springfield came to The Simpsons backyard to taste Homer‘s meat. But this not only draw attention from Springfieldians, but also from Scotty Boom, who challenges Homer to a smoke-off. While preparing smoked pork to take to the competition, Homer discovers that his smoker got stolen. Homer calls the police, but Wiggum and Lou convince Homer that his smoker is gone. 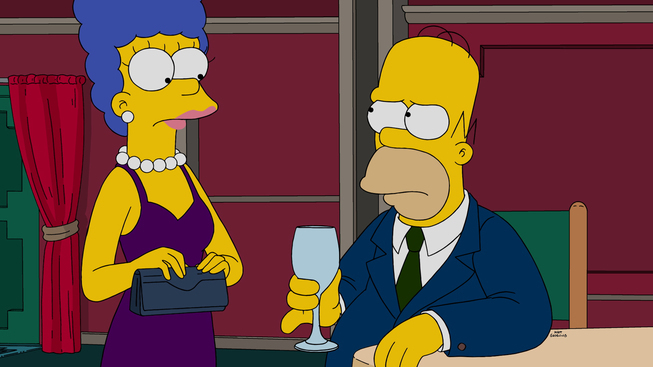 Homer gets so depressed to the point of not wanting to get drunk. This worries Bart, who asks for Lisa‘s help to track down his smoker. They investigate the yard and found out why Santa’s Little Helper didn’t bark when the smoker was taken away: someone gave him natural peanut butter, so he’d be licking instead of barking. The duo proceeds to the one store in town that sells natural peanut butter, where they “convince” a worker to let them see the security camera footage, where they discovered that Nelson bought it. They go talk to him on a park, where he’s playing a tablet game called Clash of Castles with some expensive upgrades, only to run towards a scrap yard to meet someone shortly after where he gets paid and reveals the smoker under some trees, confirming Bart and Lisa‘s suspicion. After Nelson is gone and a moment of distraction from the guy he was meeting, the siblings have their chance to take the smoker back home, but as it was too hot, they let it go on a hill, only for it to stop on the guy’s truck and he drives off. Homer, Bart, Lisa and Maggie then give up hope on the competition, but Marge convinces them that she can handle the smoke-off with the help of a rented condiments rack, but she fails miserably. But when Scotty presented his meat, they realize that the hive shaped grill marks on it didn’t match his grill’s marks, also revealing that he stole Homer‘s smoker. Scotty is fired and banned from the competition, so the Simpsons are proclaimed winners. But this does not satisfy Bart and Lisa, who try to find out how the smoker was stolen in the first place. That’s when they hear the same cellphone ringtone as the one used by the guy that Nelson was delivering the smoker to, so they decide to chase the guy down. When they catch him up, they discover that the guy is called Tyler Boom, Scotty‘s son, and he framed his own dad because he was too busy with his TV show that he didn’t spend any time with his family. So he met Nelson playing Clash of Castles and hired him to steal Homer‘s smoker in order to frame him. Scotty and Tyler soon reconcile and gives Homer‘s smoker back. After the credits, several scenes show the future of the Hive Smoker, ending with alien bee people taking the hive back into space. RECEPTION! : The episode was watched by 6.02 million viewers in its original airing. The title of the episode is a reference to the American crime drama television series True Detective. The song that plays during the hive’s journey through the years in the closing credits is “Far From Any Road” by The Handsome Family, which also serves as the True Detective opening theme. The movie shown at the beginning by Skinner is 1967’s Doctor Dolittle. Bart‘s shirt “Gooba Gooba Who?” is a reference to The Ramones song Pinhead. The end of the song chants the band’s well known slogan, “Gabba Gabba Hey!” (This song was inspired by the 1932 cult classic Freaks. The main characters in the movie chant, “Gooble gobble, we accept her, one of us!“). Master Prison Chef is a reference to the show MasterChef. Lisa mentions watching lots of Sherlock. Clash of Castles is a parody of Clash of Clans. Homer previously attempted to build a spice rack (“Itchy & Scratchy & Marge“) and Marge bought one afterwards (“El Viaje Misterioso de Nuestro Jomer“). 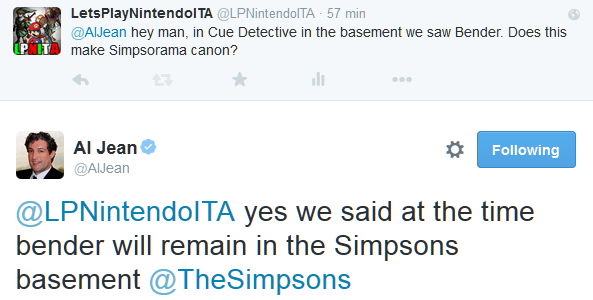 Simpsorama has been confirmed canon by Al Jean on his Twitter. When Alton Brown tastes what Marge has cooked on the show, the color of his shirt changes. On the sign for the Scrap city, the word “Sponsor” suddenly changes to “Sponser”. When Nelson spins the Merry-go-round, Lisa was not holding onto it, but she somehow stays on top of it. Normally, a person would’ve been thrown away from the ride due to momentum. Normally, Nelson is shown as a poor kid, but in this episode, he has enough money to afford a tablet. 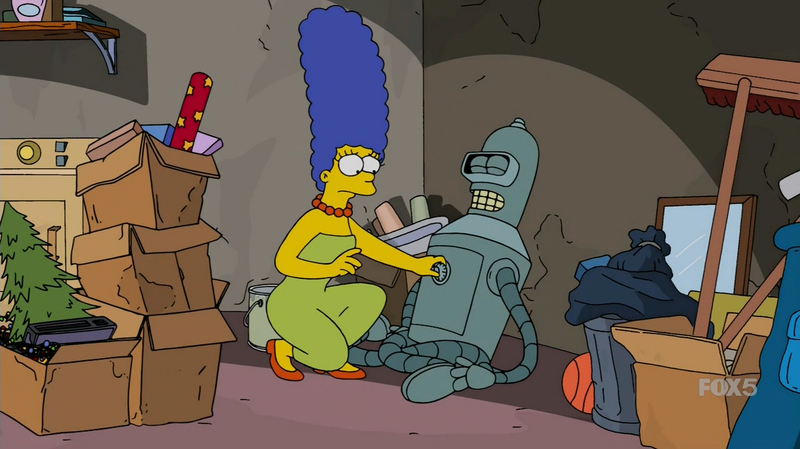 TRIVIA: Bart and Lisa seemed surprised with CRT TVs on the Scrap city, as if it were the first time they saw one, but in the earlier years of the series, they owned a CRT TV, as LED and LCD TVs haven’t been invented yet. 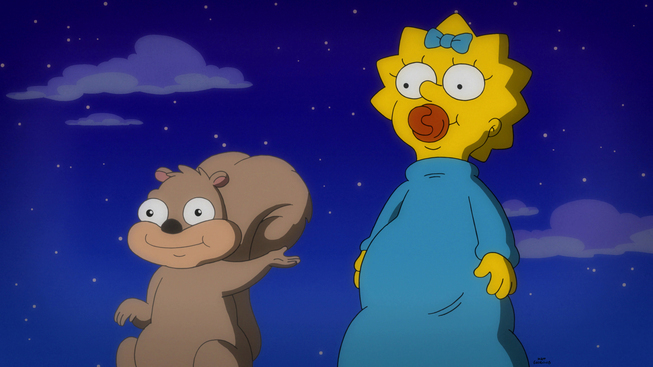 This pictures and videos are from the “‘Cue Detective” episode of FOX show The Simpsons. Their use is believed to qualify as fair use under United States copyright law. What’s the name of PitMaster’s “theme song” ? (or smoker theme song). It’s so nice..
Next How Do the Oktoberfest Promotion! Items Affect the Conform-O-Meter?